TiO2–xZrO2 films of various phase compositions were synthesized by sol–gel technique. According to the Raman spectroscopy, data films with x = 0–20% possess an anatase crystal structure, with x = 40%, exhibiting zirconium titanate ZrTiO4 structure and a film with x = 50% is amorphous. Anatase-structured films demonstrate a high and reproducible response to oxygen in a wide range of concentrations (1–20%) under temperatures of 400–450 °C. The film with 10% ZrO2 exhibits the best response, which is in particular attributed to the lower particle size of the coating compared with that of other films. It was shown that the response to oxygen upon increasing the operating temperature from 400 to 450 °C diminishes much less in the case of titanium dioxide doped with 10% ZrO2, than in the case of pure TiO2. Introduction of the Zr4+ ion into the anatase crystal structure also decreases the baseline drift. It was shown that thin films of TiO2–xZrO2 (with x = 0 and 10%), obtained in this study, possess a good selectivity to oxygen; the response to other analyte gases (H2, CH4, and CO) does not exceed 1.6 and 1.4 under the temperatures of 400 and 450 °C, respectively. TiO2–xZrO2 films of various phase composition were synthesized by sol–gel technique. According to the Raman spectroscopy data films with x = 0–20% possess an anatase crystal structure, with x = 40% exhibit zirconium titanate structure and film with x = 50% is amorphous. Anatase-structured films demonstrate high and reproducible response to oxygen in the wide range of concentrations (1–20%) under temperatures of 400–450 °C. 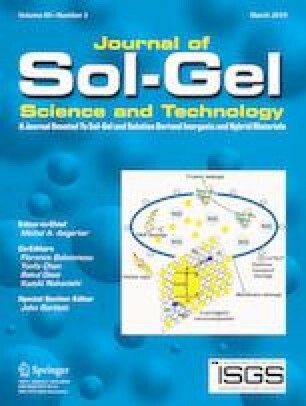 TiO2–xZrO2 films and powders were synthesized by sol–gel technique. TiO2–xZrO2 (x = 0–20 mol.%) possess anatase structure. A film with x = 40% has zirconium titanate structure, a film with x = 50% is amorphous. Anatase-structured films exhibit a high reproducible response to О2. The film with x = 10% possesses the best response to O2. The online version of this article ( https://doi.org/10.1007/s10971-019-04979-4) contains supplementary material, which is available to authorized users. This work was supported by IGIC RAS state assignment. The study has been funded by the Russian Foundation for Basic Research [project nos. 18-03-00992 (a study to the gas-sensing properties) and 18-33-20248 (development of precursors obtaining functional ink for ink-jet printing)].